Thank you very much...worked so well.. Thanks a lot. The second approached worked great. Second approach worked for me. I have no clue why these small issues are necessary all the time. Anyway, you helped me a lot! Thanks dude! The second option worked pretty good and fast for me. 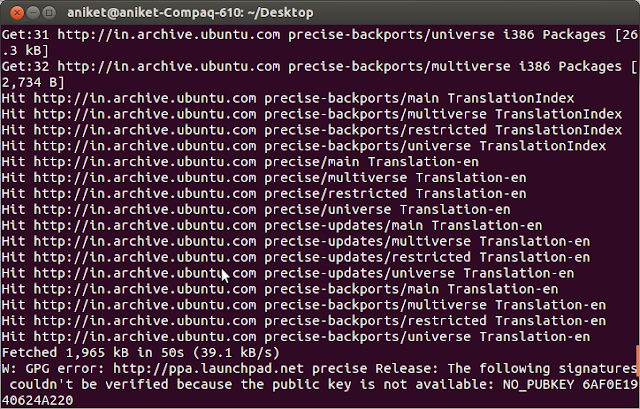 Great, the 2nd approach worked smoothly (ubuntu 12.04). I know the feeling of getting stuck with this error. Glad it helped so many people! Sorry no the approaches work for me. I don't know how to do. Thanks a lot the second approach worked for me too. Thanks for this valuable post; the first approach worked for me. It did not word for me... Neither the first or the second option; what can I do? can you help me figure out what I did wrong? @mib could you give some more specific as in what difficulty or what part is not working ? @Knoxville Looking at the output it seems your public key not available error is not longer occurring and your packages are up to date. Am I missing something? If some broken packages are creating problem try "sudo apt get clean" and then update. no they arent updating, I've rebooted the server and tried again and after it reads the package list it does nothing but drop me back to the cursor. since 14.01 lts is available for ubuntuserver now thru apt I may just reinstall anyway if I cant get this fixed easily. its not doing anything critical as its my home server that I use to tinker with so its not that big of deal, just a big hassle. 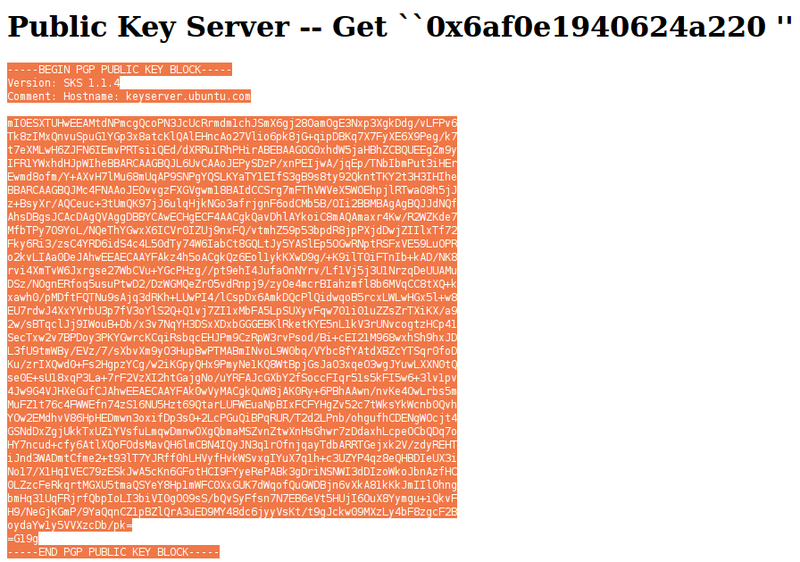 "W: GPG error: http://ppa.launchpad.net precise Release: The following signatures couldn't be verified because the public key is not available: NO_PUBKEY CBD000C02853C2C3"
Great. Thanks for this solution. Tried the second approach and it worked. And the second soultion worked!! Thanks!! Thanks for taking the time to post this. Second solution ftw! Thanks, a ton man. Really worked for me!!! Thanks a lot. The first approach worked for me! Modifying gpg.conf and resetting did not work for me either. However the first approach (getting the missing key) did work. I was missing a different key, though (4DF9B28CA252A784). Thanks for the help. 2nd approach worked !! Thanks a tonne !! Thankyou so much... It helped me.. Thanks. The 2nd approach worked for me. Thank you. The 2nd approach work for me. thanks it worked for me . can u pls resolve this issue. 2. 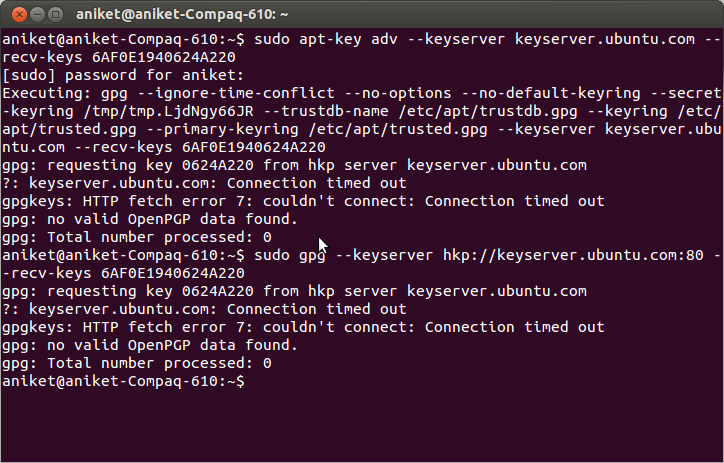 Then, I've searched key in keyserver.ubuntu, copas it then saved it as Misakovi. 3. sudo apt-get update, but still result same error in step no. 1. 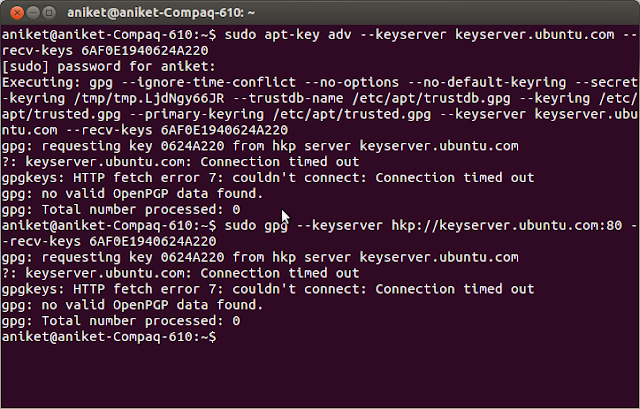 5. sudo apt-get update result in same error still. Is anyone could do me a favour? Thanks. Second approach worked like a charm. Thank you so much!